Have a Happy Halloween. Take the time to enjoy it especially if you have kids. Have a cup of cider and a donut, or perhaps a cupcake and a pumpkin spice coffee. Some of "Sandy's" work. Compared to what others received from this historic storm it's almost minor. My thoughts and prayers are with those that suffered so much from this storm. Some down time fly tying. These are a few caddis patterns, variations of a pattern Kirk ties. He uses woodchuck guard hair for the wing, I used elk hair. "Down Time Caddis"
After doing my Sandy prep on Saturday I had a few hours to fish yesterday. The day was cloudy and spotty drizzle was here and there. Most of the leaves were down and the stream was choked with them in certain areas. But there were a few holdouts and that made for a pleasant view in contrast to the bleak gray of late October. The stream was at its normal October levels, these will rise with the approaching storm. The first hookup of the day was a brown. This guy gave his best and managed to win the battle. The second trout was a surprise. Although I have taken rainbows in this stream before, about one a year, this one was somewhat different in that he was taken this far upstream. The stream was so clear. Beautiful wild trout habitat. There were several of these wild jewels brought to hand. I believe that fishing will be put on hold for a spell. Lets hope all farewell through it. Someone has been leaving their mark. Well the northeast is about to be hit by another October storm, the second big one in as many years. "Sandy" will impact Connecticut with heavy rain and strong winds. Last years October snowstorm wreaked havoc that was felt for weeks, and the small streams are still congested with fallen trees. Yesterday I had the pleasure to enjoy a pre "Sandy" outing along a small stream. A chance to view the last remaining colors of Autumn, and to be able to toss a few dry flies in an attempt to take a wild trout. While the flies worked, bringing many offerings, and a few hookups, none came to hand. Still this day was a success in many ways. The last colors of Autumn. Most of the leaves will be gone after the storm. The woods had a wonderful smell this day, it's hard to describe, but if "Yankee Candle" could duplicate it I'm sure it would be a winner. So when I returned home I tried to capture those"Last Colors of Autumn" in a streamer. I think I may have accomplished that, in as much as man can do in creating the works of nature. So today will be spent putting the deck furniture in a safe place, getting a few batteries, and some other necessities, and perhaps roasting a turkey with all the fixings. Heirlooms, I'm sure we all have some. In this case I'm speaking to those related to fly fishing. There can be a variety of them that can have very impressive monetary values, especially cane rods and some of those beautiful classic reels. There are old fly boxes such as a vintage Wheatley, landing nets, and fly collections left by family members who walked in the streams years ago. I have a few I plan to leave although they might not carry a heavy price tag they are some of the quality items I have enjoyed and will be in the family long after. Books. The printed physical type. I have many which will be both a joy to read as well as informative. Just a note. While the publishing of printed physical books has softened over the last few years, the sales of bookcases has increased. This is the one item that I consider to be an heirloom that's unique. Journals can be passed down to family members showing the wonderful times spent on the rivers and streams. You can give an account of those beautiful fish, and tell of the fly that managed the persuade him to make that mistake. While journals will never carry the monetary of a Leonard bamboo rod, there value to the families of the angler are priceless. For quite some time now, I believe it's been since August John, aka "Apache Trout" and I have tried to get together to fish. Well finally it happened Sunday. We met at a Connecticut stream that holds both wild brookies and browns. It was a sunny day, on the cool side with a good breeze. Being the time for fall colors the woods were gorgeous, and with that breeze the stream had its share of leaves also. We got geared up and were soon flinging flies. Soon a good sized brook trout was observed spawning, we watched for a spell and then moved on allowing him and his partners some space to provide a future fishery. In a different area of the same stream, one inhabited primarily by wild browns is where we were met with some aggressive fish. John working a nice pool. He was able to coax a brown from it on a dry fly, Elk hair caddis. A photo of his wonderful brown can be found on his blog, "Ravine Angler". 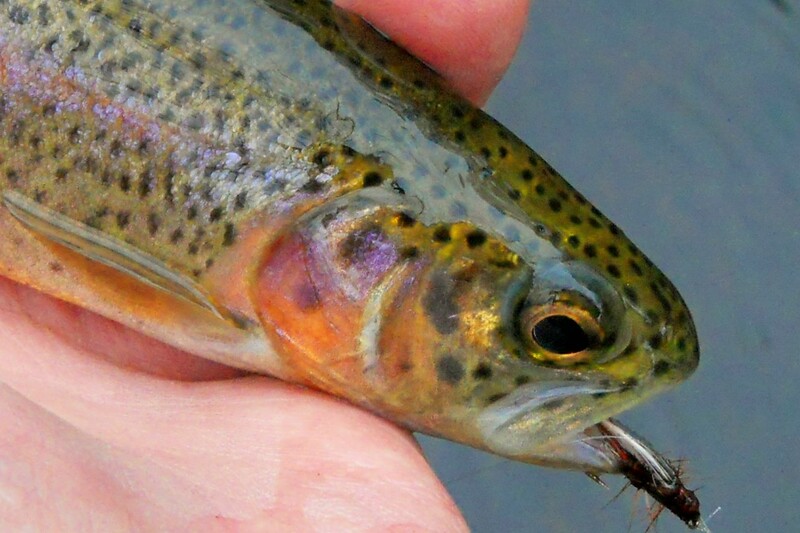 I was not given the opportunity to take a trout today on the dry, but wet flies proved to the ticket. Small stream wild browns on a Picket Pin. As the sun started to set on the stream we noticed the browns doing their courtship rituals. This was a wonderful few hours spent in good company enjoying some of what nature has to offer. Sometimes we have that tendency to over complicate things in our lives. Times when they might not be of our doing, but still they draw us into them. When I started this blog it was to show the simple, uncomplicated style of fly fishing. Simplicity, which would enable one to not only enjoy angling, but the beauty associated with it. These are a few uncomplicated and simple things that are have been associated with my fly angling over the years. Sausage and onions, placed on a crusty roll, how simple is that. Sauteed cabbage with bacon and noodles. The only thing that's complicated is weather to use a fork or a spoon. Gumbo. This might be a brain buster in the fact that we have to complicate it trying to decide what to put into it. Lets start simplifying things and get the complications out of fly fishing, well if not fly fishing then perhaps dining after we fly fish. As I sit by my desk typing this, looking out the window the rain is falling at a pretty good clip. This will be of great help in filling up some low spots in the streams. It will also speed up the leaf drop, something I will really miss. This year for some reason the foliage has been brilliant, and even wet as they are now they seem to still pop out and remain vibrant through the rain drops. Yesterday was a spectacular October day, and after some necessary home duties I had a chance to go out and enjoy the afternoon among Autumns leaves. A few shades of green mixed in with fallen hardwood covers. Sparkling waters bring out the flames of fire. Along the way a friend comes close to the leaves of fire. The name "Squaretail" is fitting. A pause to allow all that is around to sink in. These Autumn days are numbered, and I'm happy to have spent this one in such fashion, "Among the Leaves". One of the blessings of living in New England is having the ability to pick a perfect day in Autumn to be out enjoying the countryside. Another blessing is to be able to fly fish on such a day. Angling on one, or two or in my case three of the many small streams in Connecticut that hold wild trout is surely a blessing. Such was a day yesterday. I met Kirk about 9 at the first stream. A wonderful little waterway that has given up its treasures in times past. The air was crisp with a good breeze causing the leaf hatch to accelerate, this is also part of the Autumn angling. The sun was brilliant, making me wonder why my sun glasses were in the car. We fished this stream and although we had a bump or two there were no hookups. Perhaps the residents of this stream had other thoughts on their minds. Is this something educated grown men do? Fishing in such conditions, as Kirk likes to say "obnoxious". None the less that's him in that tangle. Kirk had taken several beautiful brook trout, and I had a few on but none to hand. My day was still one of those that stays with you for a long time. The time to leave was at hand, but I said I was going to stop on my drive home and fish one more stream. This stream was first fished by me about the time my daughter was five, I won't tell her age but will say I have a grandaughter that's twelve. We used to come here for picnics and to wet a line. I have fished this stream since those days. 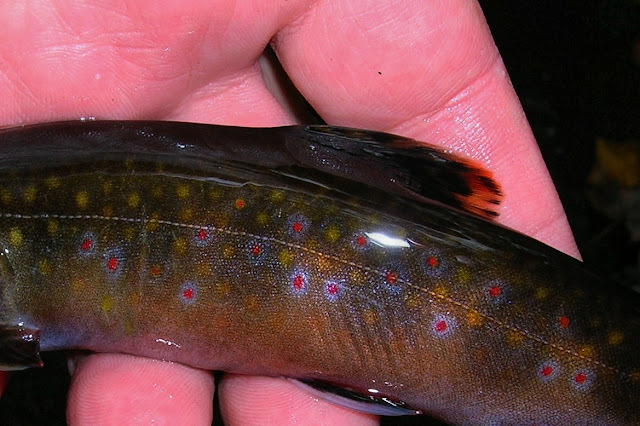 This stream has always given up wild brookies. Its waters run cool in the hot summers and it has those deep pools required for winter survival. I tossed the fly into one of the deep pools, a short drift later and the trout hit. Heading to the bank I turned the fish around and put my hand into the water and under a beautiful wild brown. It's not what I had expected, but was welcomed. Look at the size of its dorsal. Fishing further down the stream I was given the pleasure to take a brookie or two. A great day of angling in Autumn, in New England. Several years ago while posting for the first time on a local website here in Connecticut I was sort of introduced to this gentleman. We traded comments on various posts and got to know one another. He was very good at wrestling blues and stripers from the surf in Long Island Sound, his screen name was Penfield Reef Rat. It was not to long until I saw him posting on a site that was dedicated to fly fishing. We picked up on each others posts and began to get to know that there was a liking of small streams and wild trout that we both shared. Well after several attempts to get together and fish, we were successful at meeting. It was a stream that he suggested, sort of a middle point for both of us. 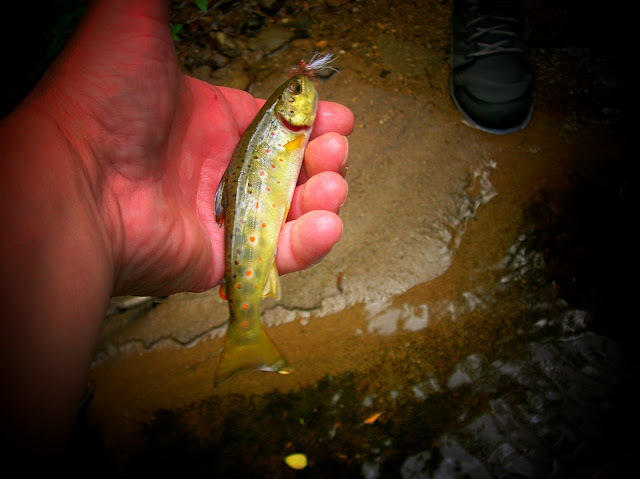 It was a stream that held both wild browns and brookies. Here is an account of that outing. This is the stream we fished for the first time. A beautiful piece of water. It had everything a small stream could. Long boulder filled pockets. plunge pools, and those classic slow dry fly runs. We fished this stream in late June I believe, but with a well shaded stream it was cool. This is one of several wild browns that came to hand on this outing, taken on a "Bomber". This is John, aka, Penfield Reef Rat, and Apache Trout. He is attempting to persuade a rising brown to take his offering. Another handsome wild brown, taken from a stream that is known to a few as the best wild brown stream in Connecticut. Thanks "John" for giving up your secret and allowing me to fish it. This small stream in northwest Connecticut has a good population of wild brookies. At time they can be found where a beaver or fallen tree causes the stream to back up and create a pond. I have fished this pond many times and a hopper or stimulator will bring a violent response. This was not the case last week when I visited here. The brookies were not here. I tried several patterns and depths and not a bump. So I moved upstream, cutting myself on the only thorns on the stream. There could be but one thorn out there and I will get ripped up by it. Yes the beauty of a freestone stream. Those beautiful hemlocks, brook trout for sure. I fished a Bomber for some time. I managed one half swirl behind it. The rise was like "get the hell out of my pool", I've got things to do. I tied on a wet fly, bringing down to where it was easier to be taken and that worked. 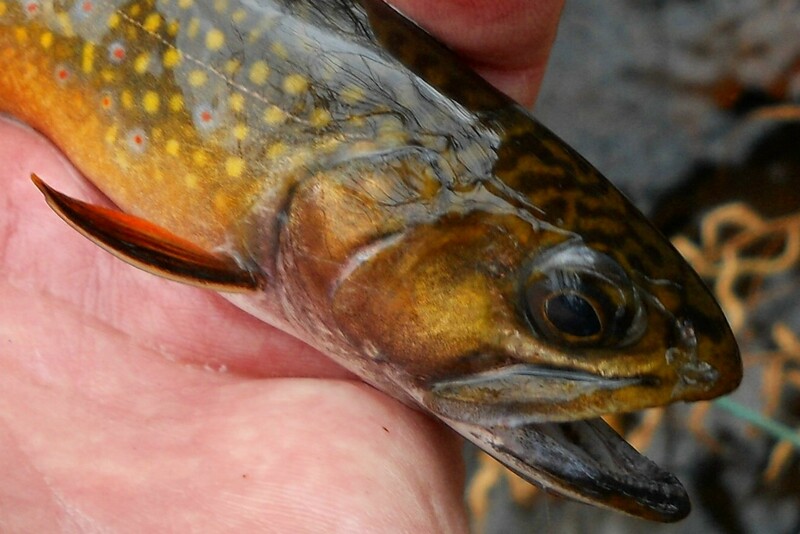 Many brookies came to hand this day, fooled by the Picket Pin. One thing stood out on many of these fish. The color, which was very light. Brookies taken in tannin waters are usually dark, but not the few like the one here. I can never get enough of this. The spots, halos, colors, and that prominent lateral line. I fished this stream for a long stretch. Stopping to enjoy all that was around. I never walk away disappointed. Sea-Run Brook Trout Coalition. Check Them Out. I have been fishing for more years that I want to say. Fly fishing since the seventies. I take the simple approach to fly fishing. Fly fishing need not be complicated. Take the time to slow down on the water and look to the grand beauty out there in its most simple form.